A few weeks ago I brought one of those cup-a-soup style miso soups and although it was nice it left me wanting the real thing. So after a bit of Internet research I found some of the ingredients on Goodness Direct and set about making some homemade miso. 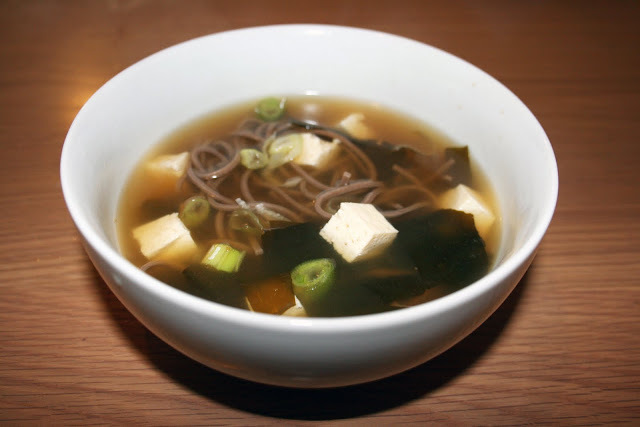 I think most miso soups have other ingredients, but to be honest this recipe is very, very easy and still tastes like real thing. I added some noodles too because to make it more of a main meal than a side dish. Start by soaking the seaweed in warm water and leave for 10 minutes. Meanwhile, add the noodles to a pan of boiling water cook for 5 minutes (or however long it says on the pack) then strain and rinse under cold water and split between two bowls. Then dissolve the miso paste in 500ml of boiling water, in a pan on a medium heat. Strain the seaweed then add to the miso, along with the tofu, turn the heat right down and sit for a few minutes so the tofu can absorb the flavour. Pour over the noodles, top with the spring onion and enjoy!